Print options contain entry areas that give you control of options related to several areas of schedule printing. Font size: You have the option to change the size of the font on the printed schedule. Here are the options to choose from: 'Tiny', 'Small', 'Medium' or 'Large'. Orientation: You can choose either Landscape or Orientation for the printed schedule. 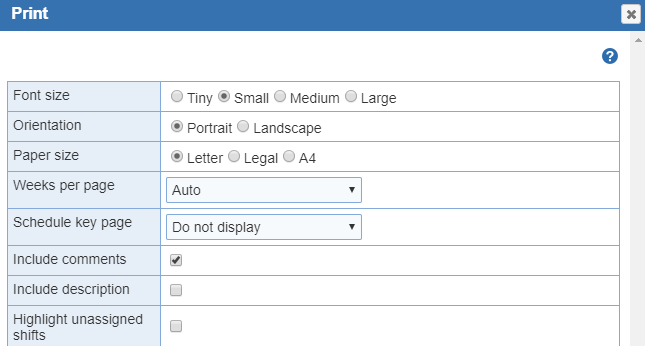 Paper size: You have the option to choose 'Letter', 'Legal', or 'A4' for the 'Paper Size'. Weeks per page: Used for printing 'Individual' and 'Master schedules'. (Use to split printing of large schedules across more than one printed page.) Select the drop down menu to choose a selection from 1, 2, 3, 4, 5, 6, Auto, and All. Example: Monthly schedules allow printing of the schedule as one week/page, two weeks/page or three weeks/page and so on. Schedule key page:Select one of these options to match how you want your schedule key printed. Last page: Schedule key will be printed only on the last page of a Individual and Master schedule. All pages: Schedule key will be printed on all pages of the schedule, accompanying the calendar portion of the schedule that is printed on that page. Do not display: Schedule key will not be printed on any pages of the schedule. Print comments: If this option is selected, the usual 'Provider comments' and 'Scheduler comments' can be printed on the 'Individual' and 'Master schedules'. If you don't want the comments, un-check the 'Print comments' check box. The printing of tables and grids is enhanced when using the browser print function. If multiple location schedules are shown on the 'Master Schedule', the main location will be printed. The highlighting from both provider selectors is reflected in the PDF.